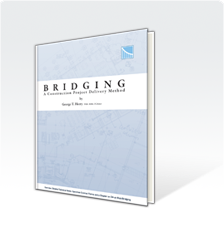 As the exceptionally good results the Bridging method, properly carried out, is bringing to Owners of new construction, remodelings and/or expansions, George Heery has just completed revising his book, “Bridging, A Construction Project Delivery Method”. A large part of the book provides detailed contract forms for use in Bridging projects including the Agreement between Owner and Contract, the Agreement between the Owner and Program Manager, and the Agreement between the Owner and the Owner’s Design Consultant (often referred to as “Bridging Architect” or “Design Architect”). The book is being published by the on-line publisher, LuLu. Low cost downloads which could well be helpful to other architects, engineers and program management professionals as well as owners, lawyers and contractors are also available as downloads from Lulu. Construction Management Industry Pioneer George Heery has assembled a comprehensive explanation and review of the Bridging method form of project delivery. This book is a must for professionals involved in the execution of Bridging projects and includes sample contract forms for review. 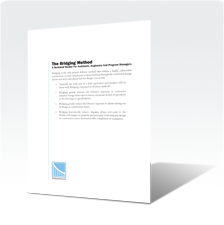 This technical review of Bridging is written for the benefit of Architects, Engineers and Progam Managers.